Last year was the first for Spinzilla, a weeklong spinning competition that encourages groups and individuals to make as much yarn as they can to claim bragging rights (as well as a trophy and gift certificates for team members). Even though the event isn’t until October 6-12, organizers are already getting people excited about this year’s competition. Registration is now open for teams through July 14, and spinners can register — either as part of a team or as rogue spinners — beginning August 4. Teams host meetups and their total yardage is compiled together for the competition. The winning team last year was Fancy Tiger Crafts, which spun almost 95,000 yards (or 54 miles!) of yarn during the week. In all, more than 1.3 million yards of yarn were spun during the week. 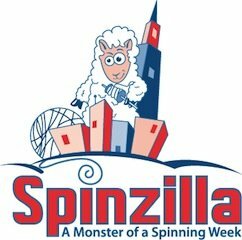 But more than just a fun event highlighting spinning, Spinzilla is also a fundraiser. The $10 entry fee goes to the Needle Arts Mentoring Program, which provides resources to people who want to teach knitting, crochet, needlepoint or spinning to groups of kids. In all the event raised almost $6,000 last year, which has that group energized to double the number of kids it reaches. Are you a spinner? Would you take part in an event like this? I’d love to hear your thoughts.